I love my natural beauty care, and sugar scrubs top the my list of favorite things. Not only are they so simple, but they are so affordable and quick! I promise, that if you start making your own body scrubs, you will never buy them in the store again. Even if you aren’t crafty, I am telling you…you NEED to make one of these! I also love how body scrubs are so customizable! You can create them with any fragrance or oil consistency you like! Put your creative pants on! Exfoliating the skin is imperative for cell regeneration! As a beauty professional (I have been a cosmetologist (hair & skin) for 10 years) I know firsthand how important it is to treat our bodies well on the outside and not just the inside. Our skin needs some natural-lovin’ too! Keep one of these in your shower and give your body a good scrub down before shaving! Your skin will be soooo soft, and you will be soooo relaxed! These are a couple floral spring inspired body scrubs that I made. Feel free to add less or more of the body or fragrance oils. 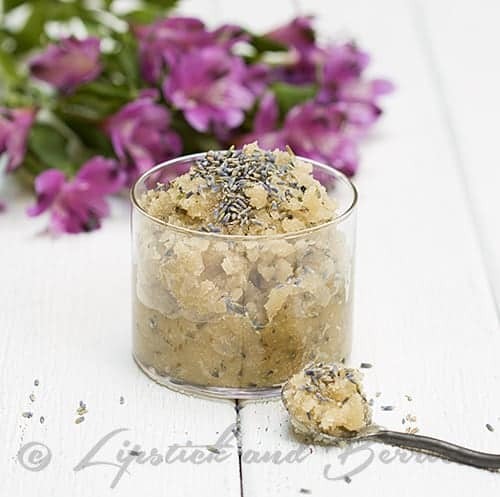 This Lavender Vanilla Scrub is an all time favorite! This sugar scrub is invigorating yet calming. The dried lavender buds give it extra flair in my opinion. All ages will appreciate this scrub. Grapeseed Oil is great for aging skin. It helps reduce fine lines while also tightening the skin. Mix everything together! Seal in an airtight container! 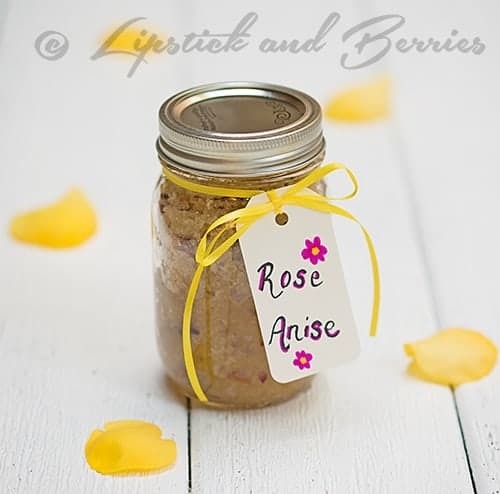 This sugar scrub has a unique twist with the addition of Anise Star (Although Anise is totally optional). Anise Star has a licorice-like scent, and in combination with rose it adds an earthy note. I like the combination of Rose and Anise because it is unexpected. I love adding the dried rose petals; it is just so pretty and organic! Almond Oil has emollient properties that allow it to be easily absorbed into the skin. It helps restore the normal PH of the skin and allows the skin to retain moisture. 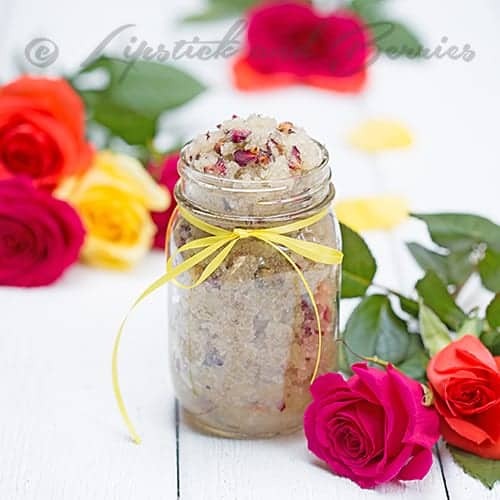 Sugar Scrubs make the best home made gifts! I bought these mason jars and tags at the craft store. Then I wrote the fragrance name on the tag, and simply tied with a ribbon! Cuteness! I want to give you a couple options on where to buy your essential oils. What I am using a product for depends on where I buy my oils. Good oils at a good prices you can find at Bulk Apothecary. When I am making products for myself or if I am using essential oils in raw food, like these Peppermint Snowballs, I use Young Living and I order from one of my sweetest friends in the world, Aleksandra of Olenko’s Kitchen! Young Living are the highest quality, food grade, organic essential oils. Beauty Recipes: Pa-Pa-Pa-paya Tropical Face Mask! I also use natural skincare and make my own scrubs and masks! I’m definately going to try one of the recipes! They look great!